The Void Entity is the boss of The Void, a secret area in the Lost Halls. It is also the “final boss” of the Lost Halls. 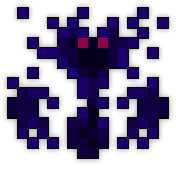 The Void Entity is the boss of a secret area in the Lost Halls, The Void. To access The Void, players must first defeat the Marble Colossus, and then consume a Vial of Pure Darkness (which is recieved from beating Malus) on the spot where he died. IMPORTANT NOTE: Once the fight with the Void Entity begins, the Pure Evil will slowly begin to swallow up the platform, reducing the amount of space you have to fight on. The Void Entity can only move on Pure Evil, which means it has more mobility the longer the fight drags on. Players have about 8 minutes in total to move the Entity to his final phase, or the Void Entity will taunt: “YOUR SOULS ARE MINE!” and Pure Evil will consume the whole platform, forcing the death or nexus of all players. The Void Entity begins circling the platform, firing various streams and spreads of his many projectiles. His shots will always come in one of many preset firing patterns, but the order in which he fires said patterns is randomized. After taking enough damage, he will go to his Minion Phase. The Void Entity continues behaving as usual, but now Void Fragments will spawn from the corners of the arena at a rapid pace. While nearly harmless, if left alone long enough the Void Fragments will grow into Void Shades, which will then grow into Greater Void Shades. A rapid, omnidirectional barrage of Void Lasers that inflict huge damage and Silence. Note that this attack is targeted at the nearest player. Dense, radial bursts of Void Vortexes that move slowly but inflict extreme damage and Silence. He is Armored while doing these attacks, resulting in 120 DEF. After taking a bit more damage, the Void Entity continues behaving as usual, but picks up speed. After he takes enough damage again, he will split the arena in half again so that it is in quarters now. He behaves as usual and can still go to the middle to attack, but he now has several additional attacks. Firing a spiralling barrage of silencing Void Shots. Firing rings of Void Spins that Pet Stasis while summoning several waves of Greater Void Shades. Like before, he will be Armored while in the middle. After taking enough damage, he continues to circle the arena but at a much faster speed. Wave 1: 4 Void Fragments, spawned on the corner platforms. Wave 2: 4 Void Shades, spawned on the corner platforms. Once all 3 waves are dispatched, the Void Entity will transition into his survival phase. The Void Entity fires omnidirectional barrages of Void Lasers, radial bursts of Void Vortexes, and rapid spirals of Void Shots one after the other at a nonstop pace. He also spawns Greater Void Shades on the platforms every so often, with 3 waves of minions being summoned in total. He is invulnerable during this phase, and players must outlast his barrage for about 40 seconds. Each clone has a quarter of the Void Entity’s HP and fires spreads and rings of Void Entity’s Void Vortexes, Void Shots, and Void Lasers (albeit less damaging versions). The Void Entity proper will be untargetable in the middle of the arena, occasionally throwing out Void Shades and Greater Void Shades, while the Clones will occassionally spawn Void Fragments and Void Shades. The Clones will become invulnerable once they reach half HP. Each one will signify this with a taunt. Once all four clones are brought to half HP, the Void Entity enters its final phase. The four clones will temporarily stop moving and shooting, and each will say one of the following lines in order. The four clones start circling and firing again, but remain invulnerable. The Void Entity itself will fire three dense, fast rings of giant void bullets that inflict serious armor-piercing damage and Darkness. It will then follow up with nine aimed 4-round shotguns of the same bullets. All the while, the Void Entity will spawn Greater Void Shades. The Void Entity will stop firing and become vulnerable for a few seconds after firing its twelve volleys. If enough damage is dealt to it, it will enter its Dying Phase. Otherwise, it will become invulnerable again and repeat the process. His body is basically a Test Chest at this point, so pour all your firepower into it. If you are a Wizard, Mystic, or Necromancer, this is the perfect time to use the Staff of Extreme Prejudice in this stage. If the Void Entity is not killed within 25 seconds, its HP gets set to 1, almost always resulting in its immediate demise. Note: If a player receives nothing after defeating this boss, they did not reach the threshold. Up to two Potions of Life and two Potions of Mana can drop per player, and two mana potions or better will drop for every player that achieves the threshold. This means that players may recieve two mana potions, a mana potion and a life potion, two life, two life and a mana, and so on, in addition to other item drops. One hell of an endgame boss. With his towering HP, devastating attacks, and nigh-complete immunity to status effects, the Void Entity is extremely tough to take down, especially with the gradually shrinking arena. However, with enough firepower and teamwork it is possible. For starters, he has a lot of shot types, and all of them are deadly. Do not underestimate a shot just because it looks harmless, all of them are equally capable of killing you quickly. Since the arena shrinks with time, how hard the later parts of the fight get depend on how fast you can deplete his health. The quicker you damage him, the easier the fight is. When selecting abilities, keep in mind that the Void Entity is immune to nearly all status effects. As such, try and capitalize on abilities that deal the most damage or provide the most bonuses instead. Samurai are an exception, as the Void Entity is vulnerable to their Exposed debuff. Since said debuff will cut the Void Entity’s DEF by 1/3 (1/6 if he’s Armored in the center), Samurai can use their Wakizashi on him to allow the group to deal more damage to him. While you may be tempted to pour all your firepower into the Entity, it is imperative to take care of the stream of minions that flow into the arena. While the Void Fragments are harmless, the Void Shades and Greater Void Shades they grow into are far from it. Don’t worry too much about getting soulbound damage: his last phase is essentially a Test Chest. By no means does this mean don’t attack him, as it is necessary to kill him in a timely manner. In addition to the last phase, damage done throughout the fight will count towards soulbound. There must be a sufficient amount of players who survived the fight with the Marble Colossus. There must be about the same amount of people in each corner. Each corner should have at least 1 healer (Priest, Paladin, and sometimes Necromancer) and 1 DPS-booster (Warrior, Paladin), to ensure that each corner has survivability and DPS. It is recommended that players form the four groups in the Marble Colossus’s room, after the Colossus is defeated but before opening The Void portal. That way, players can evaluate any changes that may be needed for each group in a safe environment. If all else fails, just stick together. Power in numbers will allow you to shred the minions quickly, and the buffs/heals will be able to reach all players. If played right, the combined DPS of all the players will be able to melt the Void Entity’s health in a moderately quick fashion. If you collected any effusions from the Treasure Pot rooms in the main dungeon, the Void Entity fight is the perfect place to use them, preferably whenever the group of players is clumped together. Effusions of Dexterity will significantly increase the group’s overall damage output. The phrase he says when activated is a reference to Super Paper Mario, where a similar shadowy figure, Shadoo, says almost the same sentence when first battling the heroes. This boss is uniquely immune to almost every status effect in the game. This includes status effects that no other entity has immunity to, namely Cursed and Armor Broken. The only status effects it cannot nullify are Bleeding and Exposed. This boss has the highest base HP of any boss. Combined with its 20% per player scaling factor, it will usually have higher HP than any entity in the game. Even before Lost Halls 2.0, it had the highest HP of any enemy in the game, with an HP value of 1,000,000. The boss’ dialogue during its final phase unveils a number of vague statements concerning its influence over the Realm. This implies that the Void Entity has been in control of a number of events and bosses that have already existed. During the dying phase of the boss, the boss will change into the shape of various other bosses in the game, as well as their surroundings. These are all bosses the Void Entity has somehow influenced in the past. The Marble Colossus was possessed and taken control of by the Void Entity in a bid to take over the Realm. Malus was influenced by the Void Entity, as seeing it take over the Colossus caused him to fully commit himself to keeping the Entity restrained within the halls at any cost. Esben was possessed by the Void Entity and used as a vessel for an unknown reason. The Killer Bee Queen was created using Pure Evil, a substance heavily associated with the Void Entity, so he was in part responsible for her mutation and possibly her escape from Dr. Terrible. While the exact details are unknown, he is heavily implied to have been the one who corrupted the Forgotten King. One of his quotes in the speed phase also imply the possibility that he was possessing him, like Esben.